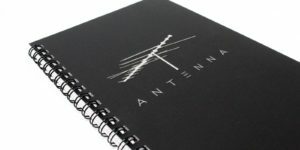 Embossing and debossing are two printing techniques that immediately take your print materials to the next level. 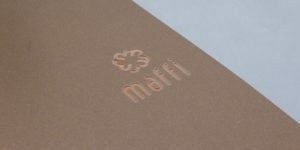 Some products we frequently use embossing and debossing techniques on include: business cards, folders, tickets, sleeves, and book covers. Embossing gives products a timeless style and can be done on many different materials. We love seeing embossing on print items, but embossing can be done on just about anything, including food! Don’t believe us? Check out this awesome embossed rolling pin for the holidays! This technique is done by sandwiching the paper stock in between two metal plates in order to create a raised text or image against the background. This leaves your product with a 3D raised design and is sure to impress anyone who receives it. Debossing, on the other hand, is done by using a metal plate to stamp an imprint into the print material, leaving a indented design. With debossing, you have the option to fill the recessed space with ink or leave it natural. Depending on how you want your print material to look, we have the option to either add ink, foil, or glaze to the embossing or debossing. If having a different texture is not what your business is looking for, we can simply do a blind embossing/debossing. Blind emboss/deboss leaves the material in its natural look and texture. Embossing and debossing your print materials are simple ways to impress. 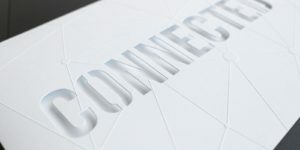 Whether you give out your embossed business card to a potential client or sell tickets with a debossed graphic, these techniques are sure to make your designs come to life!